Snow-water equivalent as a percentage of normal in Colorado's eight river basins. Summit County, part of the Upper Colorado River basin, has fared well despite a dry winter statewide. 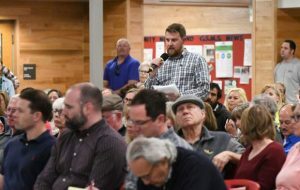 Colorado’s snowpack levels are roughly 60 percent of their historical average, and the southern reaches of the state remain in dire straits with only several months left in the snow season. 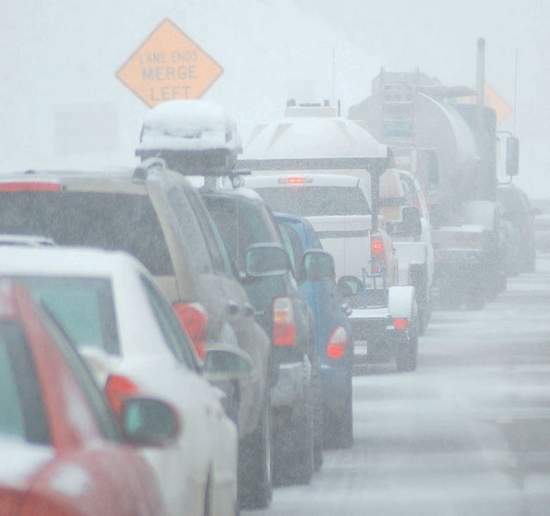 Overall, it’s shaping up to be the state’s worst winter since 2012. Water managers aren’t quite panicking yet, thanks to healthy reservoir levels that should be able to provide a backstop against drought. But if things don’t turn around soon, some of the many water jurisdictions fed by Colorado’s high-elevation snowpack could be in for tough times. As dismal scenes from Crested Butte and Telluride can attest, the southern mountains are faring the worst. The latest data show two river basins in the southwest corner of the state — the Upper Rio Grande and the San Miguel, Dolores, Animas and San Juan — at 34 and 36 percent of average snowpack, respectively. The Gunnison basin to the north isn’t doing much better at 47 percent of historical snow-water equivalent. The Upper Colorado River basin, which includes Summit County, is currently at a respectable 75 percent of average, owing partly to a La Nina affect that has been pushing storms northward. A closer look indicates that despite underwhelming snow accumulations at local ski areas, Summit County has been having an unusually strong winter. Measurements by Denver Water show that snowpack on the mountains that drains into Dillon Reservoir is roughly 105 percent of its historical average. 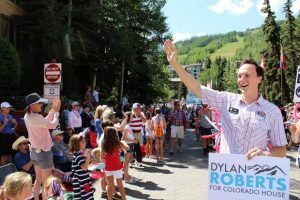 “We’re faring a little bit better than the rest of the state, and in some areas like Summit County, we’re actually doing better than we typically would be this time of year,” said Travis Thompson, a Denver Water spokesman. 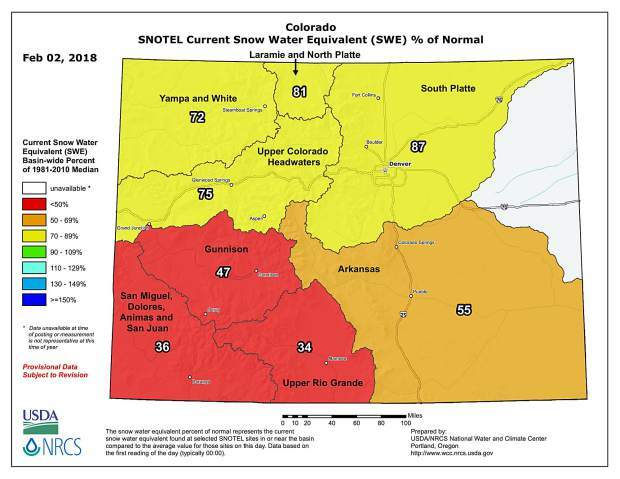 In all areas of the Upper Colorado River watershed where the agency collects water, snowpack is at 97 percent of normal, and its sites in the Upper South Platte watershed are at 91 percent. Summit enjoyed a light dusting Thursday that was expected to continue periodically into the weekend. Weak storms like that have characterized the 2017-18 winter season so far, a stark contrast to the season before, when a series of massive storms pummeled the county in December and January and built most of the winter’s total snowpack. Light snow showers could linger in Summit until Wednesday, when they will taper off and give way to dry weather through the weekend, according to meteorologist Joel Gratz of OpenSnow.com. Forecasting beyond a couple of weeks is extremely difficult, but weather watchers tentatively predict that the overall dry trend will continue. Still, things can change, and there’s enough time left for Colorado to bounce back from its lackluster snow year. One or two particularly big storms could completely erase months of low accumulations in the data.